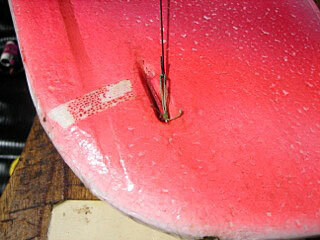 A few years ago, we started running the direct hook-up control lines through the center of the wing tips. Trying to force the steel lines through the leadout guide became an exercise in patience; this became more frustrating when we went to Spectra lines for Half-A. I decided I needed a tool. 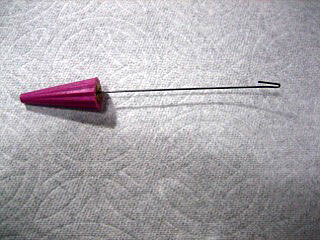 This tool began as a piece of music wire with a sharp bent hook on the end and worked just as I wanted. There was one problem; it had a habit of getting lost in the grass. This led to the current tool. I have two of them. I have two pit boxes – one for Half A and one for everything else. Each tool has its own storage position in the pit box. They are easy to make. 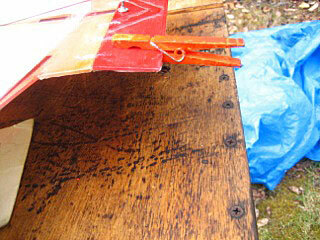 I use the top from an old cyanoacrylate glue bottle. 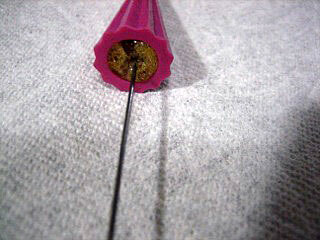 Drill a small hole in the top and insert a straight piece of flexible music wire. Next fill the inside of the top with Gorilla Glue. 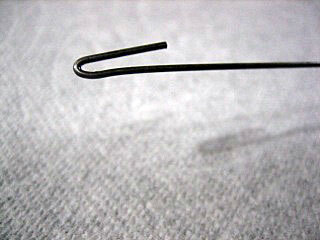 Once it's dry, trim the overflow expansion and bend the end of the wire into a hook. Another trick that I use on the Spectra lines is I take a Sharpie and mark the up line. 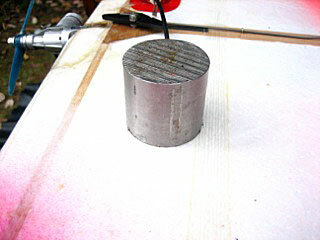 This takes the guesswork out of hooking up lines. 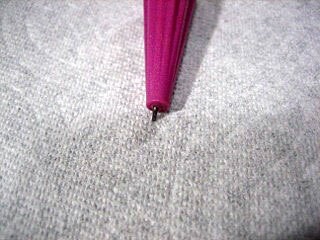 For steel lines you can use heat shrink tube over the sleeve. I fly a lot using a stooge and needed a way to check for level. A clothespin painted bright orange is attached to the elevator. 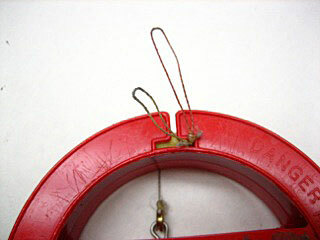 A weight is placed on top to keep the plane in place while the elevator is checked and the lines set.